So the first thing I did was research the Social Security website to look at their retirement and disability statistics. But when I compared those numbers to the overall labor force participation rate and the employment-to-population ratio (found at the Bureau of Labor Statistics' website), something didn't add up. So for about the last two years I began researching this strange phenomena. I had wondered: Did the sons and daughters of the Greatest Generation suddenly become a drag on the economy — and a drag on society in general? Did they all become a senior nation of freeloaders living off of welfare and food stamps? After spending hours and hours of digging through reports, studies, working papers, blogs (etc.) from economists, the BLS, the Fed (etc) -- I finally came to the conclusion that the decline in the work force was mostly due to a lack of jobs being created (for those who wanted to join the labor force). I determined that it was mostly "prime-age" people (not us "old" folks) who have been either 1) leaving the work force, but just as likely, 2) not even becoming a part of the work force in the first place — such as an 18-year-old, who after graduating from high school, ended up being stuck at home with their parents because they couldn't find work. I can vividly remember when I was that age. I couldn't WAIT to leave home when I was a teenager! So I really feel bad for all these young people. After all, how can someone pay rent with a part-time minimum wage job that might only be temporary*? * From the Bureau of Labor Statistics' last JOLTS report: Over the 12 months ending in November 2014, hires totaled 57.6 million and separations totaled 54.9 million, yielding a net employment gain of 2.7 million. These figures include workers who may have been hired and separated more than once during the year." I also found it odd that, some economists have been saying (and this has been parroted all throughout the mainstream media's echo chamber) that "an aging work force" is driving the decline in the labor force, while on other hand, other economists have argued that not enough of us older folks are leaving their jobs to make room for younger workers (aka "churn in the labor market") — and why youth unemployment is so high. So, which is it? It seems the Boomers are dammed if they do and damned if they don't (leave the work force). So for the past two years I've been howling at the moon (see all my links at the bottom of this) arguing that it was NOT because of older people (those over 54) who were leaving the work force; or those over 62 that were taking early retirements; or even those 65 and older that were taking full Social Security retirements. It wasn't THEY who were mostly driving down the employment-to-population ratio or the labor force participation rate. Hell no, it was everybody else — the college kids and those in their "prime age" years (25-54). So why has the mainstream media (and many well-known economists) been pushing this claim? At first I thought it was two-fold: To wedge a political divide between the Boomers and the Millennials; and to push for cuts in Social Security. The Millennials already blame us Boomers for this terrible economy, and they also don't think Social Security will be around for them when they eventually want to retire. But if the Millennials would always vote for Democrats (and only progressive Democrats), Social Security* will always be around. (And as far as the economy, the Boomers were just as screwed as anybody else). The New Yorker recently wrote: "From 1950 to 2014, the number of Americans working or looking for work expanded at an annual rate of about 1.5 per cent. But now that the baby boomers are retiring and immigration is falling, this figure is falling sharply. Between 2015 and 2025, according to a new forecast from the Congressional Budget Office, the potential labor force will rise at an annual rate of just 0.5 per cent." There they go again! Those dang Baby Boomers are screwing us all! So after reading that article at the New Yorker, I went and posted this multi-part question below for readers at an economist's blog (Mark Thoma, and he has a great blog). 1) So is the New Yorker claiming that population growth is exceeding job growth? 2) Or that a declining population is contributing to less jobs being created, and is the reason for a declining employment-to-population ratio, and a declining labor force participation rate? 3) Was The New Yorker making the argument that older people retiring (and disabled people leaving the work force, and less people immigrating) is NOT making room for new entrants (i.e. college graduates) to join the work force? But if any of that were true (assuming there were no skills mismatch -- and jobs were equally available in every region of the country, and not hindering mobility), why are there still millions of others (who are not retiring or are disabled or in school) who are still unemployed and leaving the labor force every year? One kind reader at Mark Thoma's blog replied to me with links to the two following articles (And so simple, even a caveman could understand). 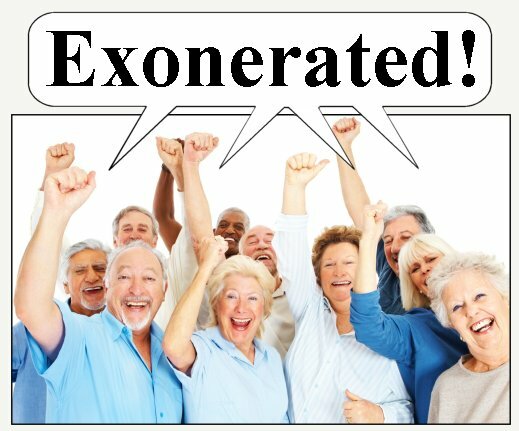 It appears that the Baby Boomers have been exonerated — not to mention, and my own gut feelings were proved correct. Below are only excerpts from these posts pertaining to the Boomers, but I would suggest that you read them in their entirety for a better perspective (also, check out their charts). The LFPR [labor force participation rate] for the "elderly" (a term I use respectfully as a member of that cohort) flattened out in the mid-1980s and then began increasing -- slowly at first and more significantly around the turn of the century, as the numbers for the productive cohort continued to decline ... Since January 2000, the participation rate for all the elderly has soared by 50 percent ... While the LFPR growth for the elderly is the most striking, we also see a noticeable decline for the youngest cohort. A significant driver of this trend has been the decision to stay in (or go back to) school for more education. Supporting evidence is found in the eye-popping growth of student loan debt, especially since the onset of the Great Recession. To be sure, some of that trend is accounted for by older cohorts heading back to school in hopes of improving their employment prospects ... For some simple math: In 2000, the three younger cohorts constituted 66% of the labor force. Now they have shrunk to 56%, which means the 45 and older workers have grown from 34% to 44% of the labor force. In the late 1990s the dream of early retirement was common among the Boomers. But the reality is that an increasing number are delaying retirement, and many who did retire have now reentered the workforce." I'll close this analysis with a chart that essentially demolishes the prevailing view of our aging population as a demographic drag on labor supply. Here is the ratio of the 65-and-over cohort as a percent of the employed civilian population all the way back to 1948 [see the chart], the earliest year of BLS employment data. Mind you ... these people are not only in the workforce, but also actually employed. The percentage of elderly employment is hovering at its historic high -- now double its low in the mid-1980s. This is a trend with multiple root causes, most notably longer lifespans, the decline in private sector pensions and frequent cases of insufficient financial planning. Another major cause, I would argue, is the often surprising discovery by many of the elderly that the "golden years of retirement" might be less personally satisfying than productive employment. Note that the growth acceleration began in the late 1990s, prior to the last two business cycle downturns (aka "recessions"). Below are a few of my related posts on the subject of Boomers — which includes links to the research I earlier mentioned. "The aging of the baby boom generation explains much — though certainly not all — of the steep decline in the labor-force participation rate ... While the aging population may be a contributing factor, it isn’t the primary explanation. A breakdown by age shows that most of the unemployed workers leaving the labor force aren’t boomers. In fact, only 5 percent are of retirement age (65 or older) ... Unemployment is concentrated among the young ... younger workers would make up an outsize share of those abandoning their job searches. Of course, these figures only look at people who were unemployed, meaning they were actively searching for work. If you look instead at people who left the labor force AFTER being employed, the numbers are much more skewed toward retiring boomers." In one of my other posts, I referenced that Five Thirty Eight article — and I noted that 3 million young people a year are graduating from high school, while only 1 million a year were retiring. So if you only look at retirees, rather than at young people who never worked, that makes more sense. After high school and college graduates can't find jobs, they drop out of work force, and that drives down the labor force participation rate. "The fourth quarter report means that growth for all of 2014 clocked in at 2.4%, which is the best since 2.5% in 2010. It also means another year, an astonishing ninth in a row, in which the economy did not grow by 3%." This period of low growth isn't "astonishing". First, usually following a recession, there is a brief period of above average growth — but not this time, due to the financial crisis and need for households to deleverage. So we didn't see a strong bounce back (sluggish growth was predicted for the first years of the recovery) ... And overall, we should have been expecting slower growth this decade due to demographics — even without the housing bubble-bust and financial crisis (that the WSJ opinion page missed) ... The good news is, that will change going forward (prime working age population will grow faster next decade). The bad news is the political hacks will continue to ignore demographics ... Right now, due to demographics, 2% GDP growth is the new 4%. * We are so far below full employment, we need at least one year of high growth. * Look to per capita GDP growth rather than to GDP growth, and ask why per capita growth should have slowed so significantly. Chinese population growth is significantly slower than that of the United States, but per capita GDP in China is growing more than 4 times as fast. * Last quarter we grew 4%, so according the Charley [? ], we all aged 5 years in one quarter! We would be better off shrinking, and getting younger. * Even with last year's above 2% growth rate, the GDP gap is still almost 3%. So we would have to have 6 years of 2.5% per year growth to finally get back to full employment. Or better, a couple of years of 3.5% per year growth. * That's it: the output gap. If there were demographic changes we'd see an uptick in inflation as the supply of workers shrinks. But we aren't. We're just seeing a drop in the unemployment rate as people drop out. * I don't buy it. "Demographics", "technology" and "globalization" are all alibis and excuses for politicized policy-making, which is redistributing upwards and slowing growth ... As Wren-Lewis points out we've had fiscal austerity since 2010. We've had wage stagnation since before then. We have a trade deficit which is exporting demand and jobs. The only reason growth hasn't been slower is because of monetary policy ... It's oddly coincidental that these supposed "demographic" changes began to bite after a negative shock and piss-poor counter-cyclical demand management policy. * As Wren-Lewis points out, we've had slow growth because of fiscal austerity. * If there were such huge demographic changes we'd see inflation, but we're seeing none.